We’d love your help. Let us know what’s wrong with this preview of Eggs in Purgatory by Laura Childs. Now Laura Childs is cracking a whole new case of murder in a brand new series?RECIPES INCLUDED. Suzanne, Toni, and Petra lose their husbands but find independence when they open the Cackleberry Club. Then their cozy cafe becomes the scene of a crime when a lawyer dies with a secret on his lips and egg on his face. What this all Now Laura Childs is cracking a whole new case of murder in a brand new series?RECIPES INCLUDED. To ask other readers questions about Eggs in Purgatory, please sign up. I find it very jarring when a writer (who's previous books I have read and enjoyed) all of the sudden gets the urge to use foul language. I understand about each series needing to be different, but I don't understand why they have to go in that particular direction. Especially when the other books (with NO language) have worked so well for them! Oh well. That said, I did like this book. After the first initial shock of language (and to be honest, its NOT like its "F" words), I really start Hmm. That said, I did like this book. After the first initial shock of language (and to be honest, its NOT like its "F" words), I really started to get into the characters. And then the swearing was very minimal. And I liked it enough that I will at least read the second book. Suzanne, Petra and Toni are great characters (their one flaw is that they love the words sh*t and a**h*le). They have loved and lived life and are ready to start again after some heartache in all three of their lives. Not bad. The food descriptions were as delicious as the tea shop series. I liked the setting - touching all of book, cafe and craft cozies. I wasn't too sure about the main character, though. Mom and I enjoyed this read very much. It was a book we had wanted to read for a little while, and it also was read at the last book in our March Mystery Madness Challenge of 2019. What a fun challenge and what an awesome read. We even love the book so much that we made one of the recipes in the back. The Blond Brownies. Over all a great book and we look forward to returning to Crackleberry Club. I didn't like this story. I was expecting this to be like the author's other series, Tea Shop Mysteries. This was too slow and too vulgar. I did like the diner and yarn shop and book shop combination. That was the best part of this book. I also didn't like the characters or mystery. Sometimes women lose their husbands and need shoulders to lean on. They may not even all "lose" their husbands in the same way, but there is something about a good friend or two that makes things easier to deal with. Suzanne, Toni, and Petra are just that; great friends in sort of similar situations looking for good support in each other. They open the Cackleberry Club, a little cafe that also has a book nook and knitting area. It goes over great and they just love what they are doing. One day t Sometimes women lose their husbands and need shoulders to lean on. They may not even all "lose" their husbands in the same way, but there is something about a good friend or two that makes things easier to deal with. Suzanne, Toni, and Petra are just that; great friends in sort of similar situations looking for good support in each other. They open the Cackleberry Club, a little cafe that also has a book nook and knitting area. It goes over great and they just love what they are doing. One day though the great times come to an abrupt end when Suzanne finds her lawyer dead in his truck behind her Club. Not just dead either...murdered! Soon Suzanne is delving in to put on her amateur sleuth hat and figure things out, after all it greatly affects her. As she digs deeper she learns that there are many secrets in her life and small town that she never had a clue about. Soon her late husband's character is put into question and Suzanne is about to loose things very important to her if she can't find answers. Will she find the answers at all? If she does, will they be answers that will help clear things up for the good or the bad in her life? Will she survive her digging into the past? Lawyers have many enemies, but what would cause one to kill him? This was the first book I have ever read written by Childs. I must say I was extremely happy I picked it up! This book was full of mystery and drama. There was a bit of background in the first chapter or two, but it was well written background, not drawn out or too much, as in some books I have read. It gave the background needed to make the rest of the book make sense to the reader, but it didn't give the whole back story of every character in a drawn out fashion that makes readers want to quit reading. I loved the characters too! Suzanne, Toni, and Petra are one funny and fun loving group of ladies. They don't take gruff from anyone and they don't see anything as too big of a challenge. They all come from rough pasts and I think it makes them more realistic to the readers, I know it did for me. I felt like I got to know them throughout the book and became friends with them. I also just loved the adorable old dog Baxter and how he really seemed to "get" his owner Suzanne. I could just see his reaction to things. The mystery and drama of it all was simply amazing. It was chocked full of twist and turns and I felt like I was on a roller coaster at an amusement park. Every time I thought, ok...got it, there would be a sudden drop I never saw coming that I was thrown down. It was a mystery that came right down to the wire before I finally figured it all out. I found the whole book very exciting and I just loved the writing style! Childs definitely has a new fan! I can't recommend this book enough and I also can't wait to read on in the next book in this series to see where the ladies go now and what happens. A must read! A small town eatery, brimming with deliciously mouthwatering breakfast fantasies is in trouble, a murder takes place in the back and the daily special is all over the corpse. Quaint charm and happy atmosphere are overshadowed by an investigation that seems to have more suspects than possible, it appears that the town is small but it holds many secrets. Suzanne, Toni, and Petra are best friends and coworkers, they run the charming Cackleberry Club together, and besides baking and cooking, brewing A small town eatery, brimming with deliciously mouthwatering breakfast fantasies is in trouble, a murder takes place in the back and the daily special is all over the corpse. Quaint charm and happy atmosphere are overshadowed by an investigation that seems to have more suspects than possible, it appears that the town is small but it holds many secrets. Suzanne, Toni, and Petra are best friends and coworkers, they run the charming Cackleberry Club together, and besides baking and cooking, brewing coffee and tea they also run a book club and a yarn shop, often housing tea parties and gatherings for special occasions. Suzanne is at a loss when her lawyer ends up murdered, but when she gets involved she barely escapes in one piece. It seems that whoever did her lawyer in has no problems going after her or anyone who wants to get involved in sleuthing, and to top it off the mayor thinks that her deceased husband has been involved in major fund theft, turning half the town against her. Battling local gossips, suspicious characters who are meddling in strange things and staying on top of her business gives Susanne and her friends more than they bargained for, but it makes for a really fun and very interesting mystery. For a cozy this has plenty of intelligence and still keeps it light and fresh, and did I mention the delectable food - this book is a must have for anyone who has a cook's block and is stumped for easy yet creative ideas, I am definitely going to make some of the savory and sweet items from it. Suzanne, Toni, and Petra lose their husbands but find independence when they open the Cackleberry Club. Then their cozy cafe becomes the scene of a crime when a lawyer dies with a secret on his lips and egg on his face. What this all has to do with a religious cult and Suzanne?s past could put her own life on the line. Kindred, Tennessee is definitely small town southern life. Suzanne one of the three owners of the Cackleberry Club cafe along with her two friends, are believable characters. This Suzanne, Toni, and Petra lose their husbands but find independence when they open the Cackleberry Club. Then their cozy cafe becomes the scene of a crime when a lawyer dies with a secret on his lips and egg on his face. What this all has to do with a religious cult and Suzanne?s past could put her own life on the line. Kindred, Tennessee is definitely small town southern life. Suzanne one of the three owners of the Cackleberry Club cafe along with her two friends, are believable characters. This cozy mystery has a touch of humor plus enough red herrings to keep you guessing about the culprit until the end of the book. I loved the Cackleberry Club along with its little rooms with books, knitting supplies, and homemade items. Perfect setting for a cozy mystery. It was great to see Suzanne reaching out to others in the community when they needed help and the ending with the church gathering in the Cackleberry Club to have service was a nice touch. A quick, enjoyable cozy read. This is the first book in the series. I will be reading the others. Recommended for all cozy mystery fans. FAVORITE QUOTES: Prayer of a Breton Fisherman: "Lord,the sea is so wide and the boat is so small. Be with me." "A hug is the perfect gift. One size fits all, and nob0dy minds if you return it." "Always leave room in your life for the angels to dance." This is the first book in the Cackleberry Club Mystery series by Laura Childs, who also writes the Tea Shop Mysteries and the Scrapbook Mysteries. Suzanne and her best friends Toni and Petra are co-owners of The Cackleberry Club, a restaurant/teashop/bookstore/yarn shop that has become very popular in the burgeoning town of Kindred. One morning her attorney, Bobby Waite brings over some papers for her to sign, and a little while later, is found in his truck outside the building, with a bullet in h This is the first book in the Cackleberry Club Mystery series by Laura Childs, who also writes the Tea Shop Mysteries and the Scrapbook Mysteries. One morning her attorney, Bobby Waite brings over some papers for her to sign, and a little while later, is found in his truck outside the building, with a bullet in his chest. Believing that the local sheriff is in over his head, Suzanne decides to investigate on her own, and ends up trying to clear her husband's name of fraud. Once again, Childs has created some wonderful characters. But the plot just requires too many coincidences and wild leaps of logic in order to reveal the killer's identity. I haven't really noticed this in her other series, so hopefully it's an anomaly. I'm looking forward to getting to know the inhabitants of Kindred, and trying out some of the recipes from the Cackleberry Club. This book was disappointing since I love Childs' Tea Shop series. This is the first book in a new series, and while the main character started out sort of unique, (with a tough-chick attitude), she ended up sounding just like the main character in the Tea Shop series. The story line seems very similar too, since it involves three people who own a restaurant. It felt like a lesser version of her other books. I'm sure I'll still read the next one though. Easy read. Like able characters. I get hungry reading this book. Loved the Eggs in Purgatory recipe. But the recipe calls for 8 eggs, I did it with 4, and more chipotle. The three ladies that run the Cacleberry Club are a hoot. Suzanne, Petra & Toni complete each other. I could see myself at this restaurant, wishing there was a real one in my city. And No, the butler didn't do it. Can't wait to serve up the next book Eggs Benedict Arnold. My first reading Laura Childs. LOVE IT! First in the CACKLEBERRY CLUB MYSTERY series. Getting ready to start the 2nd, Eggs Benedict Arnold. Don't you love the titles? Anyway....the 3 ladies of the club/restaurant are magnificent. Good food, bookstore, knitting group...and murder!!! Story moved right along and was a fun read. I like cozy mystery books. But this was too cozy and it read more like a commercial.. The author couldn’t describe anything from glassware to automobiles without brand names so much so I was beginning to think she was getting paid for product placement rather than writing a novel. Interesting story and loved the characters. Looking forward to the next book in the series. A cozy little mystery, entertaining but predictable in its outcome. I really enjoyed Laura Childs' first book in her "Tea Shop Series" and was looking forward to trying this series. This first book in this series was about three women who lose their husbands in various ways (one is still living, but in a home), and they run a restaurant, bookshop, and various other projects. While this sounds interesting, it was way too much. It was almost as if the author wanted to make one book that contain every type of theme. Although the author introduced us to all three wo I really enjoyed Laura Childs' first book in her "Tea Shop Series" and was looking forward to trying this series. This first book in this series was about three women who lose their husbands in various ways (one is still living, but in a home), and they run a restaurant, bookshop, and various other projects. While this sounds interesting, it was way too much. It was almost as if the author wanted to make one book that contain every type of theme. Although the author introduced us to all three women, the focus in this book was Suzanne. For being one of the main characters, I struggled to like her. Rather than appearing strong, I found her character constantly rubbing me the wrong way with her attitude. To me she was rude rather than tough or strong. I also found the language a bit crude. Nothing extreme, just a bit crude. I also found it too easy to figure out who did it. I gave up reading at chapter 16. I flipped to the end and I was right about who did it. 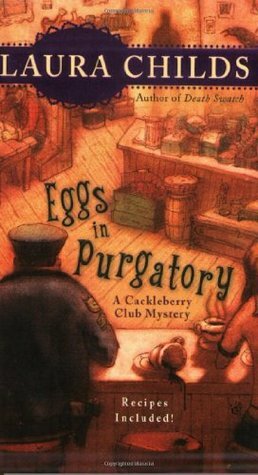 Eggs in Purgatory by Laura Childs is the first book in the Cackleberry Club series. I have wanted to read this one for some time and finally got around to it. :) I'm glad I did. This cozy mystery had a lot going on. Suzanne, Toni and Petra are the owners of the Cackleberry Club~an egg restaurant, book store, yarn shop and more. With a couple of murders, a secretive religious organization, a famous romance author, a church fire, a woman on the run, afternoon tea...this and much more make up Eggs Eggs in Purgatory by Laura Childs is the first book in the Cackleberry Club series. I have wanted to read this one for some time and finally got around to it. :) I'm glad I did. This cozy mystery had a lot going on. Suzanne, Toni and Petra are the owners of the Cackleberry Club~an egg restaurant, book store, yarn shop and more. With a couple of murders, a secretive religious organization, a famous romance author, a church fire, a woman on the run, afternoon tea...this and much more make up Eggs in Purgatory. Since there was so much going on, the story was a little hard to follow at times. But I stuck with it because there was so many mysteries to be figured out, I didn't want to stop until I knew what happened. If you prefer a bit of an unconventional cozy (with some cursing) and several settings/themes rolled into one, then you will like Eggs in Purgatory. The recipes in the back of the book are a great bonus and I look forward to making a few of them. I love Laura's Tea Shop Mysteries. I read those when I can find them. I have wanted to give the Cackleberry Club series for awhile, and I finally got to start a series with book 1. This book took a little longer than I would have liked to finish. The mystery was slow and the premise for me felt like it was an amalgamation of her other series. They have teas, they have knitting and there is a restaurant and book store. I want to know where there are places like this in the actual world, because I I love Laura's Tea Shop Mysteries. I read those when I can find them. I have wanted to give the Cackleberry Club series for awhile, and I finally got to start a series with book 1. This book took a little longer than I would have liked to finish. The mystery was slow and the premise for me felt like it was an amalgamation of her other series. They have teas, they have knitting and there is a restaurant and book store. I want to know where there are places like this in the actual world, because I would so want to go there, but I can't imagine a shop like that surviving in a real town. I enjoyed the story, but it got bogged down with a lot of filler. There was so much going on in the ladies lives, as well as the mystery and I think that's what made this book a little harder for me to get into. I had to remind myself that this is a first book in a series, so you have to have a certain amount of time spent getting to know the characters. I really didn't figure out the killer. This review has been hidden because it contains spoilers. To view it, click here. Oh what a story. Women owns a Cafe/knitting/book store with her friends and finds dead bodies. Gets herself into mischief and is on the hunt to clear her (in this case her husband's) name and by the end of the book she does. The story wasn't supposed to be something that I couldn't put down but I just felt like continuing to read. It's a regular story with regular people in a small town. Kind of like Star's Hollow (if you get the reference). The author throws in a few characters as an attempt of Oh what a story. Women owns a Cafe/knitting/book store with her friends and finds dead bodies. Gets herself into mischief and is on the hunt to clear her (in this case her husband's) name and by the end of the book she does. The story wasn't supposed to be something that I couldn't put down but I just felt like continuing to read. It revolves around 3 women who run a small town store that is a combination breakfast/lunch diner, bookstore, knitting store, and afternoon tea shop. Suzanne, one of the 3, has recently had her husband pass away and her lawyer, who came to drop off some estate paperwork, is killed in the parking lot of their store. Murder, mystery, suspects and surprise around every corner. Laura's a great author and plan on reading all of her books. Huh. I thought when I circled back to read the first book in the series I'd have found out more about the CC opening and the friendships between Toni/Petra/Suzanne. Not so much. Just a case of "here is what was, now here's what is and let's get into murder, shall we?" Which is weird because I swear it seems like the CC just opened and yet they had... no hurdles? No learning curve? No struggles, if one ignores the bodies that'll turn up because it's a mystery series? Really? Took me a little to get into this book & honestly wasn’t sure I liked it until half way through. Loved the food theme & descriptions of the menu being served. Look forward to reading the next book in the series. Laura Childs is the New York Times bestselling author of the Tea Shop Mysteries, Scrapbook Mysteries, and Cackleberry Club Mysteries. In her previous life she was CEO/Creative Director of her own marketing firm and authored several Laura Childs is a pseudonym for Gerry Schmitt and she is the best-selling author of the Tea Shop Mysteries, the Scrapbook Mysteries, and the Cackleberry Club Mysteries.